Be it 24 hours or 1,000 miles: races over particularly long distances are an extreme challenge in motorsport. After all, the performance of the competition vehicles is just as decisive here as their reliability under constant maximum stress. Mercedes-Benz has been impressive in these areas since the beginning of the motorsport history of the brand. One of the first highlights was the Paris – Bordeaux – Paris road race, which was carried out from 11 to 14 June 1895 over a distance of 1,192 kilometres. Of the first eight vehicles to finish, there were six cars equipped with engines according to a Daimler licence and two Benz vehicles. Sauber-Mercedes C 9 Group C racing car, Le Mans 24-hour race, 1989. With starting number 63, the winning vehicle of Jochen Mass/Manuel Reuter/Stanley Dickens. With starting number 62, the team of Jean-Louis Schlesser/Jean-Pierre Jabouille/Alain Cudini, which ended in fifth place. Photo from 1989. In the tradition of the great European road races, in the mid-20th century, the Italian Mille Miglia stands out in particular. Mercedes-Benz was twice able to attain outstanding victories there. In 1931, Rudolf Caracciola and co-driver Wilhelm Sebastian in the Mercedes-Benz SKKL were the first to take overall victory as drivers not from Italy. In 1955, the masterpiece of the British team of Stirling Moss/Denis Jenkinson in the Mercedes-Benz 300 SLR (W 196 S) racing car followed: Moss with the best time ever achieved at a Mille Miglia, ahead of team colleague Juan Manuel Fangio. In 1957, the Mille Miglia was carried out as a classic road race for the last time. Mercedes-Benz, however, also continued to be very successful in such long-distance competitions outside of Europe in the following years. For example, the Argentine Touring Car Grand Prix, a strenuous race over almost 5,000 kilometres, was won by the brand from Stuttgart four times in a row with saloons of the W 111/112 model series: 1961 (one-two win), 1962 (win by Ewy Rosqvist/Ursula Wirth), 1963 (quadruple win) and 1964 (triple win). The return of Mercedes-Benz to racing after the end of the Second World War was also connected to the Mille Miglia: the new 300 SL (W 194) racing car premiered on the Brescia to Rome and back endurance classic on 3 to 4 May 1952. Karl Kling and Hans Klenk came flying in with a respectable second place in the overall standings. 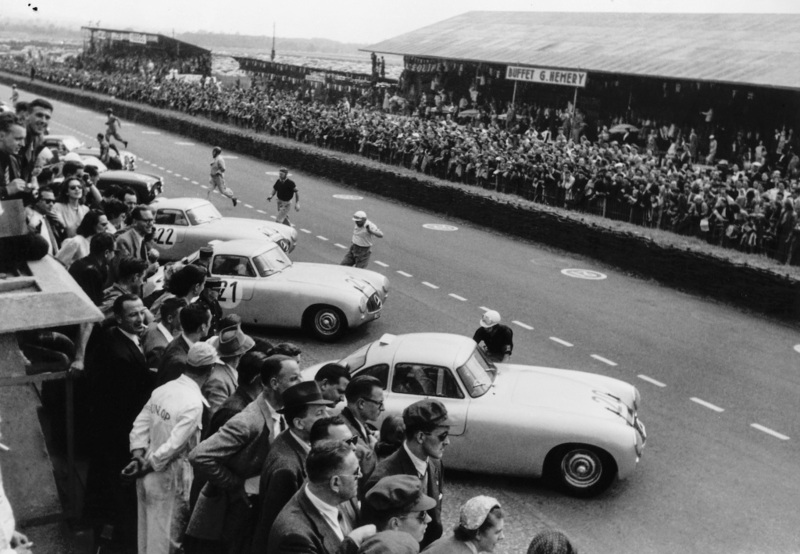 The 300 SL celebrated one of its greatest triumphs in an endurance race on the racetrack: Mercedes-Benz attained a one-two win at the Le Mans 24-hour race from 13 to 14 June 1952. The overall standings were led by Hermann Lang and Fritz Rieß ahead of their team colleagues Theo Helfrich and Helmut Niedermayr. Three years later in 1955, Mercedes-Benz was in the lead at Le Mans with its 300 SLR racing car. 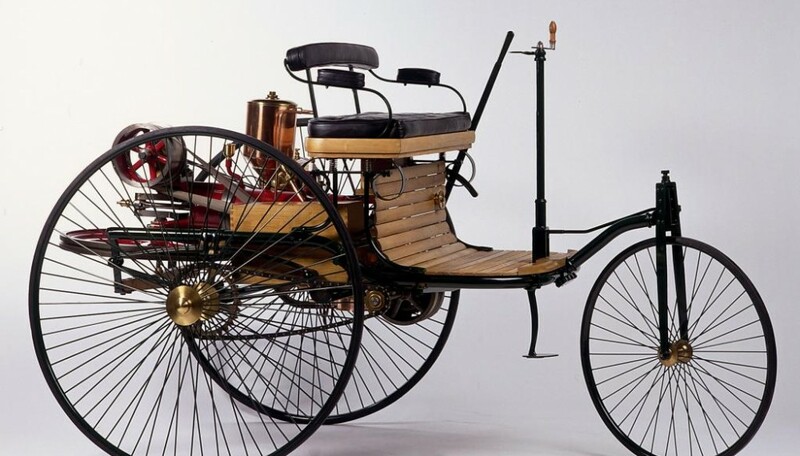 After the very tragic accident involving the Silver Arrow of Pierre Levegh, for which nobody was at fault, Mercedes-Benz withdrew its remaining vehicles out of respect for the victims of the accident. 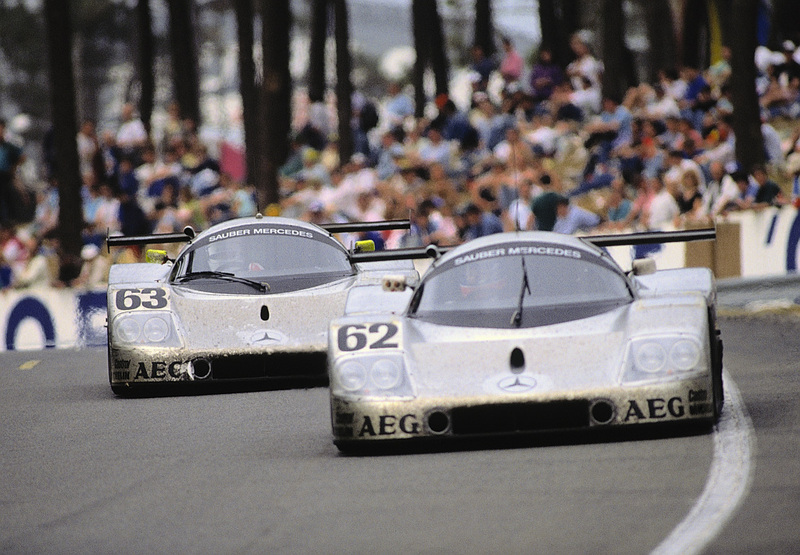 Thirty years ago, the Silver Arrows once again won in Le Mans: the Sauber-Mercedes C 9 Group C racing car attained a one-two win at the 24-hour race from 10 to 11 June 1989. The teams of Jochen Mass/Stanley Dickens/Manuel Reuter as well as Mauro Baldi/Kenny Acheson/Gianfranco Brancatelli led the overall standings. This was a highlight of the return of Mercedes-Benz to racing on a racetrack. Thirty years ago, Jean Louis Schlesser won the World Sportscar Championship in the Sauber-Mercedes C 9. The team title of the World Championship went to Sauber-Mercedes in 1989. Both title wins were repeated the following year with the Sauber-Mercedes C 11. Fascinating sports car races inspired the fans of the FIA GT Championship at the end of the 1990s. Mercedes-Benz dominated the first two years of this international racing series with the Mercedes-Benz CLK-GTR (1997, championship title for Bernd Schneider) and CLK-LM (1998, championship title for Klaus Ludwig and Ricardo Zonta) GT racing cars. Modern day successes with the sign of the Mercedes star by the Mercedes-AMG customer sport teams are reminiscent of those triumphs. Amongst others, the BLACK FALCON team has already won the Dubai 24-hour race four times (2012, 2013, 2015, 2018). 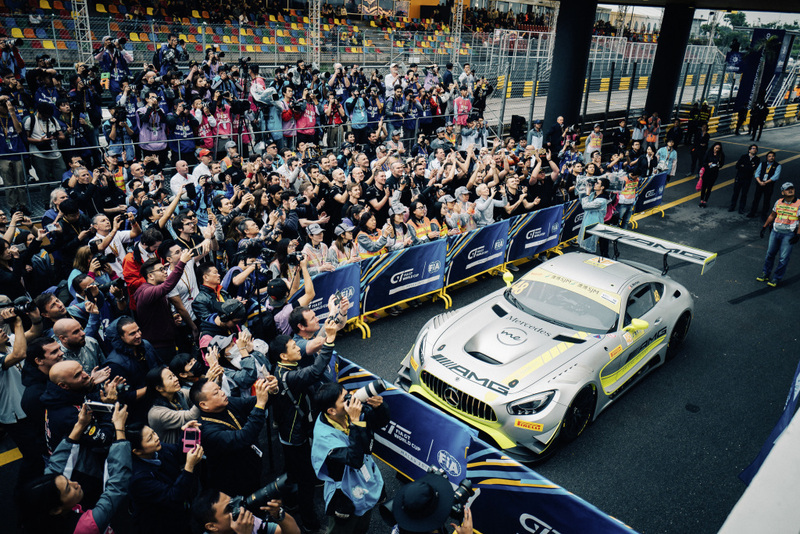 Maro Engel won in 2015 at the first FIA GT World Cup in Macau in the Mercedes-Benz SLS AMG GT3; Edoardo Mortara won in the same race in 2017 in the Mercedes-AMG GT3. The 2016 ADAC Zurich Nürburgring 24-hour race was completed by the Mercedes-AMG GT3 with an incomparable quadruple victory. 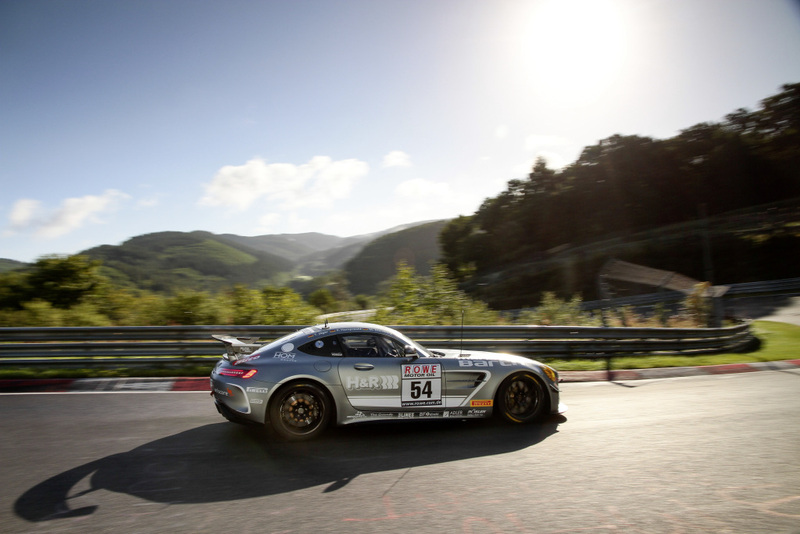 Since 2018, alongside the GT3 racing cars, the near-production Mercedes-AMG GT4 customer sport racing cars have been used. With over 130 wins and more than 40 titles, the past year was the most successful season of Mercedes-AMG Customer Racing to date. In every win and in every championship, there is the desire for competition – this is the theme for 125 years of motorsport with Mercedes-Benz. 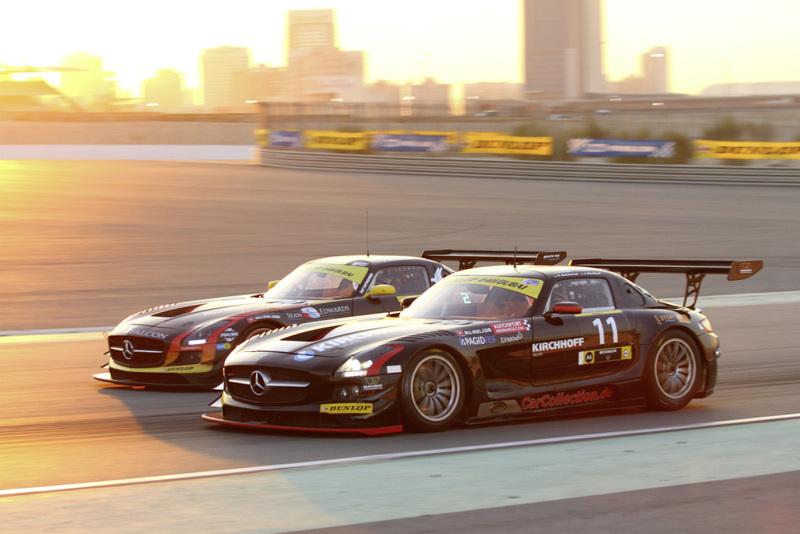 Mercedes-Benz SLS AMG GT3 customer sport racing car, 2014 Dubai 24-hour race. Photo from 2014. Mercedes-AMG GT4 customer sport racing car, VLN Endurance Championship, Nürburgring 2017. Right on its first outing, the new Mercedes-AMG GT4 attains a class victory in the highly competitive starting field of the ROWE 6-hour ADAC Ruhr Cup race. Mercedes-AMG GT3 customer sport racing car, 2017 FIA GT World Cup in Macau, vehicle of Edoardo Mortara, Parc fermé. Photo from 2017. Sauber-Mercedes C 9 Group C racing car, Le Mans 24-hour race, 1989. 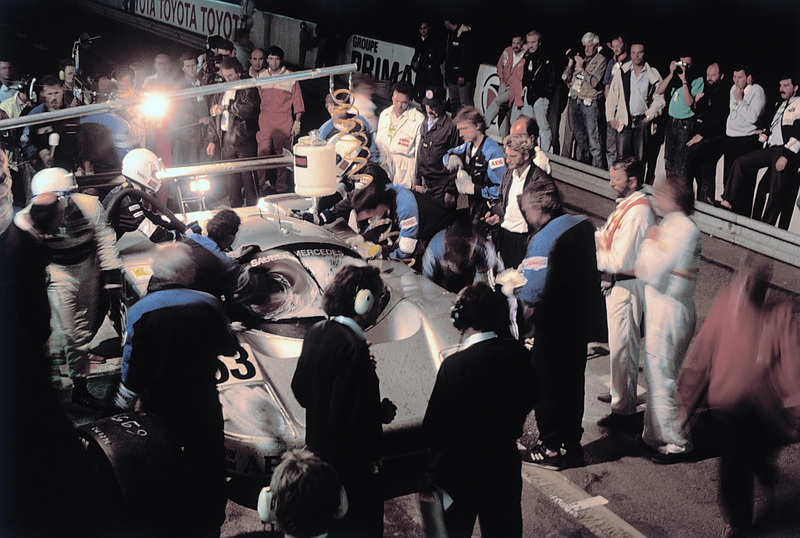 Night-time pit stop of the later winning vehicle with starting number 63. Jochen Mass is ready for the change of drivers. Photo from 1989. 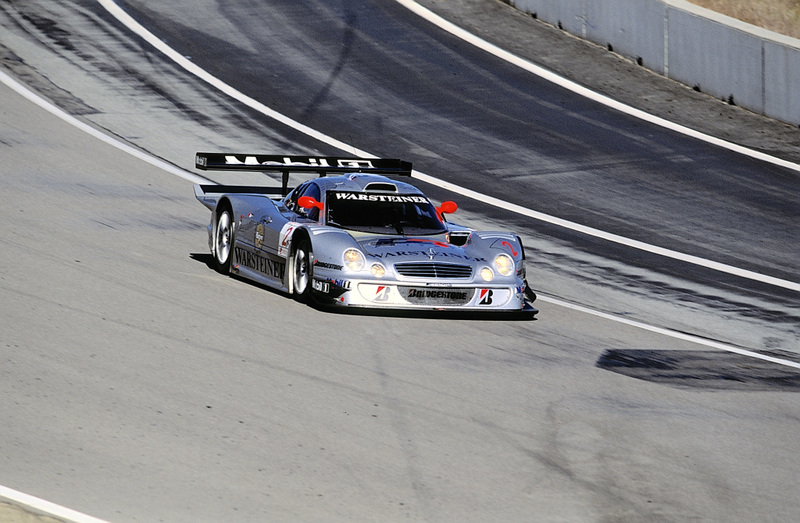 Mercedes-Benz CLK-LM GT racing car, 1998 FIA GT Championship, final race of the season in Laguna Seca, California, USA, 25 October 1998. Winning car of the team of Klaus Ludwig/Ricardo Zonta. Photo from 1998. Panhard Levassor with a Daimler-Phoenix engine, Paris–Bordeaux–Paris race from 11 to 14 June 1895. 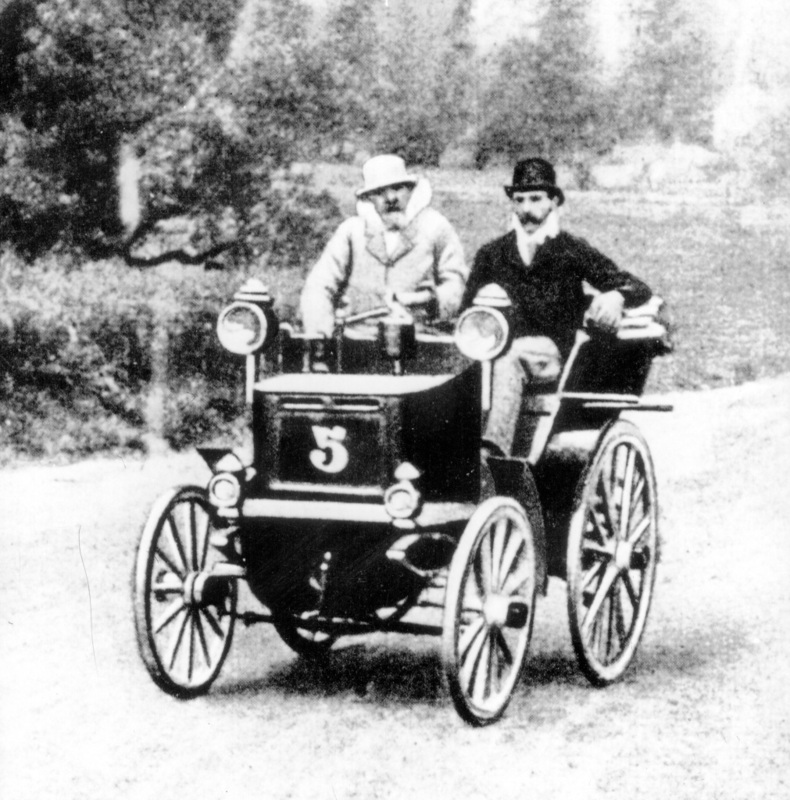 Emile Levassor (at the wheel) and René Panhard were first to cross the finish line. They were only to receive second place, however, as the two-seater vehicle did not fully correspond to the specifications. The endurance race in which only the driving time was assessed was, after the Paris–Rouen reliability race of July 1894, the first car race as we understand it today. Photograph from 1895. Mercedes-Benz 300 SL (W 194) racing car, start of the Le Mans 24-hour race, 1952. At the legendary Le-Mans start, the drivers run from their marked positions to the cars stood opposite them. The second vehicle from the front with starting number 21 is the later winner piloted by Hermann Lang and Fritz Rieß. Right at the front is the 300 SL with starting number 20 piloted by Theo Helfrich and Helmut Niedermayr, who finished second. Photograph from 1952. 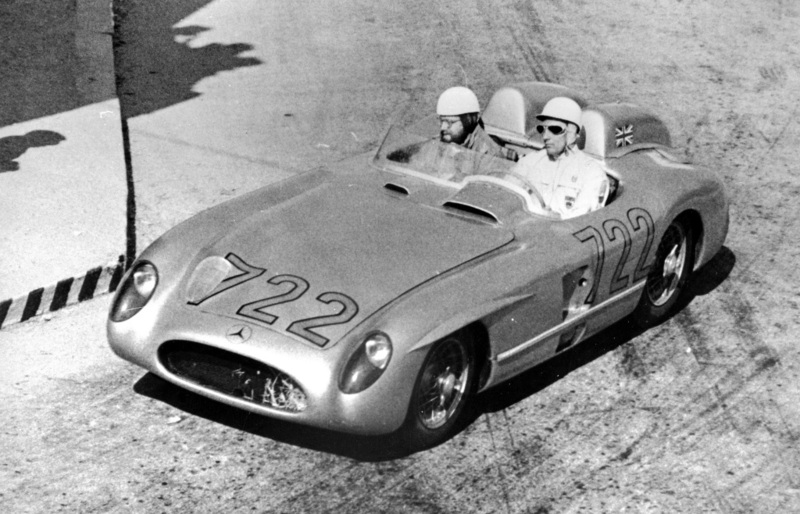 Mercedes-Benz 300 SLR (W 196 S) racing car, Mille Miglia 1955, Stirling Moss and Denis Jenkinson in the later winning vehicle with starting number 722. Photograph from 1955.